Appleby College is an international independent school (grades 7-12) located in Oakville, Ontario, Canada, founded in 1911 by John Guest, a former Headmaster of the Preparatory School at Upper Canada College. Guest dreamed of establishing a small boarding school in the country, and did so with the support and financial assistance of his father-in-law, Sir Byron Edmund Walker, a prominent Canadian businessman and patron of the arts. Today, Appleby is a co-educational day and boarding university-preparatory school, with a curriculum based around the liberal arts. It is situated on Lake Ontario in Oakville, Ontario, roughly 50 kilometres west of Toronto. Students are drawn primarily from Oakville, Burlington and Mississauga, but boarding students come from other parts of Canada and throughout all continents of the world. Appleby is the only Canadian member of the G20 Schools. It is also a member of the International Round Square Organisation and the Canadian Independent Schools Athletic Association. Appleby is accredited by the Canadian Educational Standards Institute. On October 13, 2006, Maclean's Magazine named Appleby one of Canada's Top 100 Employers. Appleby is the first high school ever to receive this distinction. Appleby has identified six "Pillars of Strength" upon which to concentrate: Community Spirited, Technologically Empowered, Universally Diverse, Academically Vital, Globally Responsible, and Actively Engaged. Appleby students and faculty use technology in virtually every aspect of student life (currently Fujitsu Lifebook T4410 tablets and SMART Boards). Appleby was the second school in North America to fully utilize laptops and other technology in all areas of the school, after Cincinnati Country Day School. Each boarding room and classroom is equipped with internet ports and power outlets. A large portion of the assignments are done on the computer and subsequently emailed to the teacher. The academic program of Appleby College gears students towards writing AP examinations with a broad range of AP courses. Students at Appleby College generally take several AP courses in the Senior 1 and Senior 2 years. Currently, the AP courses offered at Appleby College include: AP Art History, AP Biology, AP Calculus AB, AP Calculus BC, AP Chemistry, AP Computer Science, AP English Literature, AP French Language (AP French Literature was offered until the exam was discontinued in 2009), AP German, AP Human Geography, AP Macroeconomics, AP Music Theory, AP Physics B, AP Psychology, AP Statistics, AP United States History, and AP World History. As well as being a day school, boarding is offered from Grades 9 though 12 (7 and 8 can board but they live with faculty who live near campus) and there are numerous international students from over 20 countries attending Appleby. When the school first opened in 1911, boarding was mandatory. Over time as the Greater Toronto Area grew, Appleby became less of a "school in the country" as originally envisioned by John Guest, and more of a mixed day and boarding school in the suburbs. Less than half of students now board. However, in keeping with a tradition that has been maintained since 1911, all students in their "Senior Two" (Grade 12) year are required to go into residence. Approximately 240 students are currently in residence, the majority of whom are in Senior Two. There are four houses in which Appleby's boarding students reside, and with which the day students are affiliated: Baillie House; Walker House; Colley House; and Powell's House. Baillie House is a girls' residence and named after a prominent family that has attended and supported Appleby for several generations. Walker House was one of three boys' residences before co-education and is now a girls' residence, and is named for the school's original benefactor, Sir Byron Edmund Walker. Colley and Powell's are boys' residences and are named for former Appleby Masters. T.B. Colley taught at Appleby for 35 years and was housemaster of School House, which was renamed in his honour in 1949. Vernon Powell received the Military Cross and died during World War I. A view of Appleby College's Creek Field at the southern end of the campus. Powell's House and Colley House can be seen in the distance and the Appleby College Forest is shown on the left. The school has spacious grounds with a main classroom building, dining hall, arena, five playing fields (one football size), five tennis courts, three squash courts, a gymnasium, a 20m swimming pool, four boarding houses and the Anglican John Bell Chapel, designed in the Westminster style. 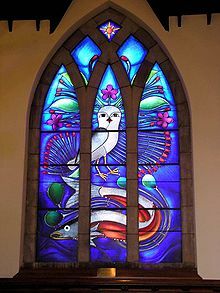 The chapel houses the first ever Inuit-designed stained glass window, created on commission by Kenojuak Ashevak, O.C. As well, the south boundary of the campus runs along the shores of Lake Ontario, and a creek runs through the west side of campus, bordered by playing fields and forest. There are four residences at Appleby: Walker, Baillie, Colley, and Powell's, each with its own distinct structure and style. Both Colley and Powell's house are boys' residences and are on the west side of campus while Walker and Baillie are girls' residences and are closer to the east side of the campus. Colley House is housed in the original Appleby School building (School House) which dates from 1911. Throughout the year each house is responsible for hosting charitable events as well as open houses, for other boarders to attend, and chapel weeks, for the entire school to attend. Each house has three designated faculty members who reside within it (Housemaster, Asst. Housemaster, and the Residential Don) as well as a house prefect and house executive committee composed of students that are responsible for keeping dialogue between faculty and students within the house open. Students are assigned affiliation with a boarding house in the third term of Middle Two (grade 8) or prior to entry into Upper One (grade 9). Students in Middle School are in the Nightingale house, which houses only Middle Twos and Ones. Membership of the houses can be distinguished by house ties, which depict the house colours and are worn by students as an optional substitute for the school tie. Each house is represented by an animal that is displayed prominently by a large mural in each of the residences. Baillie House is represented by a tiger and the color green, Colley House by a bulldog and the color red, Powell's House by a lion and the color yellow, and Walker House is represented by a grizzly bear and the color light blue. In order to accommodate the various sports teams that Appleby offers the campus is equipped with four full size soccer/rugby fields, an astro-turf field for field hockey and lacrosse, brand new full sized ice rink equipped with private dressing rooms for both varsity boys' and girls' teams with new stands, a fitness room, three squash courts, a climbing wall, a full size gym, two outdoor basketball courts, a beach volleyball court, a 50-yard swimming pool, as well as a fully equipped athletic therapy centre open to all students. Due to the growth of the College, the Memorial Classroom Building is no longer the only area offering classroom space. There are four science labs located by the Appleby Arena and several more located on the science wing. Each of the houses, Walker being the exception, are also home to classrooms that are located on the basement level of the houses. All classrooms at Appleby are equipped with internet and power supply ports for students as well as a SMART Board. The Samuel Academic Resource Centre is home to the Williams IT Centre, the Raymond Massey Reading Room and the Appleby Archives. The SARC has collaborative spaces, small meeting rooms and comfy chairs. When not booked for meetings the Raymond Massey Reading Room is available for silent study and has Raymond Massey's personal library. The John Bell Chapel has been an important aspect of the Appleby community since its erection, and students attend chapel several times each week. Each Wednesday a student delivers a chapel speech, and other services are organized by Houses or other student groups. Rev. Craig Luccock is the current Chaplain and though an Anglican chapel, many other faiths' religious texts and teachings are incorporated in the spirit of inclusiveness and religious education. The Chapel serves as a gathering place for the Appleby College community, especially in times of great joy or great sorrow. The chapel features several stained glass windows including 'Iggalaaq' (2004) by Kenojuak Ashevak and Sue Obata. Special events held in the Chapel include the Opening Service for the boarding community, the Carol Services for each grade, the Christmas Eve Service featuring an Alumni Choir, the Remembrance Day Service, the Ash Wednesday Service, and the Leaving Service on Closing Day. The McLaughlin Northern Campus, located at the school's private island, Rabbitnose, in Temagami, Ontario, hosts two sets of trips annually. In the winter months, January and February, Upper Two students take part in five-day winter survival trips that are based on the island. These trips are led by both Senior One and Two instructors and are overseen by faculty members. In the summer months, September and October, Upper One students take part in seven-day canoe trips that are also based on the island. An optional trip utilizing the campus's facilities is also offered the week following Closing Day. In addition to co-curricular activities and the Northward Bound program, each Appleby student is required to participate in the school's athletic program. Grade nines and tens (Upper Ones and Twos) must have three full terms of sport, and grade elevens and twelves (Senior Ones and Twos) must have two (the other term must be spent doing community service or engaging in a full-time arts activity). Interscholastic competition is offered in soccer, field hockey, swimming, basketball, hockey, tennis and rugby, among others. Ironically, two of the longest standing and formerly most prominent Appleby team sports are no longer offered. Cricket was played since the school opened, and was discontinued in 1992. There was a movement within the student body to re-instate cricket as an instructional sport in the 2004–2005 year. Football was also played since early in the school's history, and was discontinued in 2005. Appleby's greatest period of success in football was during the 1960s when the first team achieved a string of almost unbroken winning seasons. The best seasons were 1966 and 1967 when the team went undefeated in inter-scholastic play. The success of the 1967 team, in particular, who defeated not only Appleby's Old Boys in an exhibition game, but each of the first teams of the "Little Big Four" schools, Upper Canada College, St. Andrew's College, Ridley College and Trinity College School, led to Appleby joining the CISAA, where all of Appleby's different sports teams have competed since. David Smith coached the first football team from 1957 to 1980. He was himself a former Appleby student and taught English and coached football at Appleby for a total of 34 years, retiring as a teacher in 1991. Appleby's first football team achieved its next and last undefeated season in 1985, under the coaching of alumnus Dave Singer. This was the school's only CISAA championship for first-team football. The school had also fielded strong teams in the early 1980s when former CFL star Jeff Fairholm played. Beginning in the mid-1990s, the program's senior team, then coached by Jim Mackay, began contending for the Don Sutherin Gray Cup against Hillfield Strathallan College. Appleby and Hillfield would play on each school's homecoming weekend, with the overall winner being decided by total points for and against. The rivalry ended in 2002 when Hillfield discontinued their program. During the same period, the program's junior team experienced great success, which peaked in 2000 when Appleby finished in second place with a five wins and one loss record. The team made and hosted the championship game; however, the juniors lost to Ridley College 7 to 6. With the switch to a four-year high school program in 1987, Appleby struggled to field competitive football teams, eventually withdrawing from CISAA competition. In 2003, the senior team re-entered the CISAA conference, when all Ontario high schools switched to the four-year high school program. After the 2004 season, the school elected to end the program. Ice hockey has been played at Appleby since the school's inception, and is considered to be one of the most important core programs, if not the most important, offered at Appleby. Appleby currently fields four teams, three boys' and one girls'. In recent years Appleby had extremely strong competitive teams, winning gold at the aa/a boys' and girls' tournaments in 2011. Rugby union has been a prominent spring sport since the early 1970s, and continues to be popular for both boys and girls. The school's period of greatest success for rugby was under the coaching of former physics teacher Jim Washington, who coached the first rugby team from 1970 to 1989, achieving a winning record every season during that period. The years between 1973 and 1985 were particularly dominant, with the first team going undefeated almost every year and winning 11 out of 13 CISAA championships. More recently, the first boys' team won the 2005 Canadian Association of Independent Schools tournament held at Bishop's College School in Lennoxville Quebec. Soccer remains a popular sport for boys and girls, played in the fall for boys and spring for girls. The boys' first soccer team has also enjoyed considerable success in CISAA competition, winning consecutive CISAA championships in 1982 and 1983 under coach Colin Revill. Under the coaching of Tosh MacFarlane, Appleby again won the CISAA championship in 1986 and then three straight championships between 1990 and 1992. They also won the Championship in 1997 and again in 2013. During the late 1970s, Appleby also won a number of championships for first team squash, coached by the late Ned Larsen, Appleby's fourth headmaster. In recent history, the varsity squash program has regained much of its former prominence winning team championships as well as an individual distinction for players. Appleby enjoyed tremendous success in swimming in the 1970s winning four out of a possible five CISAA first team championships between 1976 and 1980 under coach and longtime Appleby geography teacher John Berriman. The swim team was also extremely successful more recently winning the CISAA co-ed championships each year between 1997 and 2000, as well as 2004–2007, under coach Sheila Kuyper and Brooke Millman. It is considered one of the main core sports at Appleby. The team travelled during the 2008-2009 season to Costa Rica for a training camp. The Appleby swim team is the most successful team on campus with six consecutive CISAA championships over the past six years. No other team has done this at Appleby. 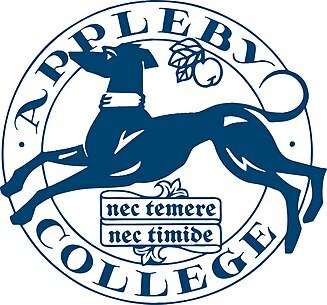 Though officially no rivalries exist between Appleby College and other schools, Ridley College in St. Catharines, Ontario is often viewed as a potent rival of the Blue Dogs. The Ridley Tigers are viewed as among the top teams in CISAA Athletics, and thus matches against this rival are met with heightened intensity. Boys' athletic teams at Appleby tend to have stronger rivalries with schools stemming from Appleby's history as an all-boys school. Upper Canada College in Toronto, Trinity College School in Port Hope, and St. Andrew's College in Aurora are deemed as important rivals of the Blue Dogs in boys' competition. In addition to both Athletic and Northern Campus commitments, Appleby College students are expected to pursue interests in the arts. Several options are available to students in this regard, as many students have artistic interests that go beyond the conventional arts of visual, vocal, and dance. Arts co-curriculars are varying and many hold a deep rooting in Appleby's storied history. One such co-curricular is the Appleby College Model United Nations club, having participated for many years in various local and international competitions, in recent years the school has gained international recognition for the success of their programme. In 2007 a small delegation from Appleby attended the Lake Erie International Model United Nations Conference (LEIMUN) and were awarded the top prize for small delegations in attendance with six of the seven student delegates receiving awards of distinction in their councils. Appleby College students have also found much success on the university Model United Nations circuit with several students winning awards of distinction at the 2007 York University Model United Nations Conference (YMUN). Appleby students also annually attend the North American Invitational Model United Nations (NAIMUN), the Students' League of Nations (SLN) in Geneva, Switzerland, the Stanford University Model United Nations (SMUN), Harvard University Model United Nations, Secondary School United Nations Symposium (SSUNS), and the UNAUSA Model United Nations Conference in New York. Many Appleby students have been recognized for distinction at these conferences. Since 2005, Appleby College has hosted its own Model United Nations conference each year in April, the Appleby College Model United Nations (ACMUN). Over 400 students attend the conference from around the GTA. The conference is organized annually under student leadership and is headed by the elected ACMUN Secretary General. Further to the success of the Model United Nations program, the debating team of Appleby College has also been noted for its wide-ranging success with several debaters ranked provincially, nationally and internationally. In some aspects of the College, debating is mandatory either as part of a course (particularly in Upper 1, and Senior 1) and as an evaluation tool and competition (S1 Joan Schoeffel Debating Competition); however, debating is purely optional at the inter-scholastic level. Appleby students have consistently placed high in local, national and international debating competitions. An Appleby student won the Canadian National Debating Championships for the first time in 1985 (Michael Raynor '86, Harvard '90, Ivey '94, HBS '00). In 2008, an Appleby student came second in the World Debating Championship (Sulaiman Hakemy '08, now at London School of Economics). In 2009, an Appleby student came first in the parliamentary debating component of the Canadian National Debating Championships (Kosaluchi Mmegwa '10, then Princeton University). In 2010, Appleby students took the 1st and 5th places in all of Ontario in the Qualifiers for the national championships to take place in February. Another avenue students are welcome to pursue their interest in the Arts is through Musicals and multiple choirs. Those students in grades 7 and 8 have the opportunity to participate in a musical that is held on property every spring. Students in grades 9-12 are welcomed to the Oakville Center for Performing Arts where they put together a Musical and present to the school and surrounding community. Appleby also boasts a chapel choir made up of students from all years and all skill sets. They perform regularly in chapel, in Christmas Carol Services, and participate in choral competitions. In addition, the auditioned Cantus choir (for students in grades 9-12) performs regularly and has toured in North America and beyond. Originally called Appleby School when it opened in 1911 (the school had 29 students), it was renamed Appleby College in 1941. An Appleby School crest c. 1915. The first Argus (the school yearbook) was published in 1916. The school chapel was completed after seven years of construction, and dedicated in November 1929. In 1956 the memorial entrance to the classroom building was completed, in commemoration of the Appleby boys and master who had been killed in World War I and World War II. Appleby marked its 50th anniversary in 1961 with a significant building expansion. A dining hall was built and named after John Guest, the founder and first headmaster. A third boarding residence, "New House" was opened, later renamed Walker House after the school's original benefactor. In 1968 the school chapel, formerly the Memorial Chapel, was expanded to its present size and renamed the John Bell Chapel in honour of the third headmaster, who retired that year. The first Appleby Quarterly, Appleby's alumni newsletter, was also published this year. In 1970 the swimming pool and J.S. Gairdner hockey arena were opened. Previously Appleby hockey was played at the Oakville Arena. In 1971 with enrollment rising, Appleby was split into a Junior and Senior School. Junior School consisted of grades 4 through 8. Previously the school had admitted boys as young as grade 1. Senior School consisted of grades 9 through 13. In 1973, Appleby introduced the innovative Northward Bound outdoor education program at the school's "Northern Campus" on Rabbitnose Island, Lake Temagami. In 1976, participation in the Senior School Cadet Corps became optional for students in grades 11 through 13. In 1984, it became a completely voluntary corps. Appleby maintained #440 Royal Canadian Army Cadet Corps for 93 years, until 2008, and it was open to both boys and girls. In 1979, the school cook, Hilda Chattaway, reached a remarkable milestone of 50 years of continuous service to Appleby. She continued to run the school's kitchen until her death in 1985. In 1982 the Junior School boarding dormitory located on the top floor of Colley House was named after her. However, boarding for the Junior grades was discontinued in 1990. Appleby commemorated its 75th anniversary during the 1985–1986 school year. Memorable events from that year included the first football team's undefeated season and first and only CISAA championship, and the visit of Lady Mountbatten to officially open the new wing to the classroom building. The new facility was called Nicholas Court and housed facilities for art, music and debating, in addition to new classrooms. Appleby was one of the first high schools in Ontario to eliminate Grade 13, moving to a four-year program with a "double cohort" graduating class in 1987. All high schools in Ontario moved from a five-year to a four-year program as of 2003[update]. In 1990, Saturday classes were eliminated. Previously, a chapel service and classes were held on Saturday mornings and sports were played in the afternoon. Up until the 1970s, boarders had also attended a Sunday church service at St. Jude's Anglican Church in Oakville. Prior to becoming co-educational in 1991, Appleby was a school for boys only. Girls were admitted in grades 6 to 11. Before then, Appleby's sister school was St. Mildred's-Lightbourn School, an Oakville private school for girls. Appleby and St. Mildred's often collaborated in drama, for example. At the same time that girls were admitted, grades 4 through 6 were phased out and the Junior School/ Senior School division was eliminated. Michael Nightingale was the Director of the Junior School for all twenty years that it was in existence. In 1993 Appleby saw its first co-educational graduating class. By that fall, the school had taken on its present character of a completely co-educational school for students in grades 7 through 12. A fourth boarding residence, Baillie House, was also built for female students. Major Vernon Harcourt De Butts Powell, MC, was a House Master at Appleby College, after whom one of the boarding residences is named (Powell's House). He served as an artillery officer in the Great War with the 15th and 13th Batteries, Canadian Field Artillery, and commanded the 53rd Battery, CFA. He received the Military Cross for gallantry under fire. Major Powell died of his wounds in London in early January 1918. Robert Snowden taught English at Appleby from 1975 to 1985, and is now Headmaster of St. Michaels University School in Victoria, British Columbia. He taught at Ridley College after leaving Appleby, and served as Dean of Students of that school as well. He is an Appleby alumnus, and was the Head Prefect during the 1969–1970 school year. David Howie taught History at Appleby in the 1980s and 1990s, and was formerly President of Athol Murray College of Notre Dame in Saskatchewan and Head of School of St. John's Ravenscourt School in Winnipeg. Christopher Shannon, another History teacher of the same time, is Headmaster of Lower Canada College in Montreal. Catherine Raaflaub, former Appleby Assistant Headmaster (School & Community Relations), became Headmaster of Strathcona Tweedsmuir School near Calgary, Alberta, between 2004 and 2006, but then returned to Appleby to assume the role of Assistant Headmaster (School & Community Relations) and Director, Advancement. Angela Terpstra, former Appleby Assistant Headmaster (Curriculum), is now Principal of the Senior School at Bishop Strachan School in Toronto. ^ Appleby College (September 6, 2018). "Appleby College: Tuition Fees". Appleby College. Retrieved February 11, 2018. ^ "2007 Reasons for Selection, Canada's Top 100 Employers". Archived from the original on 2012-07-30. ^ "Our Mission and Vision". Archived from the original on 2010-11-02. ^ "Ferdinand Herbert Marani (architect)". Dictionaryofarchitectsincanada.org. Retrieved 2013-08-04. ^ "Governor General's Order of Canada page for George Stuart Atkins". Archived from the original on 2007-09-30. Wikimedia Commons has media related to Appleby College. This page was last edited on 6 March 2019, at 16:55 (UTC).